• For quantitative determination of phospholipase D activity and evaluation of drug effects on phospholipase D metabolism. • Sensitive. Use 10 μL samples. Detection range: colorimetric assay 0.06 - 10 U/L, fluorimetric assay 0.04 - 1 U/L. • Simple and High-throughput: the assay involves addition of a single working reagent and can be readily adapted to high-throughput assays for drug screening. • Phospholipase D (PLD) catalyses the hydrolysis of the phosphodiester bond of glycerophospholipids to generate phosphatidic acid and a free headgroup. Abnormalities in PLD expression have been associated with human cancers. BioAssay Systems method provides a simple and high-throughput assay for measuring PLD activity. In this assay, PLD hydrolyzes phosphatidylcholine to choline which is determined using choline oxidase and a H2O2 specific dye. The optical density of the pink colored product at 570nm or fluorescence intensity (530/585 nm) is directly proportional to the PLD activity in the sample. 1. I was curious how much PLD protein was used per well to generate the two data graphs shown in the product information for the kit. The specific activity of an enzyme in terms of U/mg varies with the preparation and can also decrease over time. Our current phospholipase D (from Streptomyces sp.) has a specific activity of 6 U/mg. 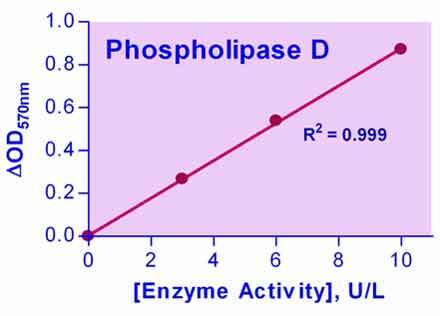 So if we want to reproduce the graph on the datasheet, we need to use 1.67 mg of our phospolipase D to obtain the 10/UL data point. The specific activity of your enzyme preparation may be much lower (or higher) and you should to titrate the preparation starting at the highest possible concentration. 1. Zhu X et al (2014). The role of phospholipase D1 in liver fibrosis induced by dimethylnitrosamine in vivo. Dig Dis Sci. 59(8):1779-88. Assay: Phospholipase D in Rat tissue (Pubmed).